Some general considerations in building a good fishing pond are outlined in this section. The best fishing ponds have a surface area of at least 1 acre. Ponds less than 1 acre in size are more difficult to manage because the fish populations, especially largemouth bass, can be easily overharvested. Small, shallow ponds are more likely to have problems with aquatic vegetation, unbalanced fish populations, and low water levels caused by droughts. 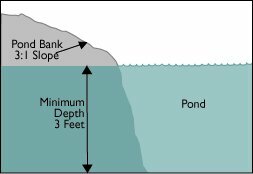 Ponds less than 1 acre in size are probably best managed by stocking only channel catfish (see the Fish Stocking section). An important feature of a fishing pond is the water control structure or drainpipe. This structure will allow you to drain the pond to make repairs, manage the fish populations, and control nuisance aquatic plants. A drainpipe that has a bottom draw maintains good water quality by drawing stagnant water from the bottom of the pond. A trash rack over the standpipe will help prevent structural damage. Another necessary feature for water overflow from a pond is an emergency spillway. While the drainpipe carries water during normal runoff, an emergency spillway carries flood runoff away from the pond so the dam is not damaged or destroyed. Your pond construction advisor will be able to recommend an appropriate emergency spillway for the size of your pond. When constructing a fishing pond, remove all brush, trees, and vegetation from the site before the pond is filled. Fish populations in ponds with structure removed are easier to keep in balance. In addition, if you ever need to use seines to remove excess stunted sunfish, no obstructions will be in your way. If needed, some type of structure can be added to the pond at a later date. New ponds should be constructed in time to fill them during late summer or early fall, which is the best time period to stock sunfish. Immediately after construction, establish permanent grassy vegetation on the top and sides of the dam. Sow the grass seed with lime and fertilizer and then mulch it with straw. Once the vegetation is established, regular cutting on the top and sides of the dam will keep trees from growing, thus preventing weak spots in the dam.